Established in 2015, Eden is a platform for office management. Their application acts like a marketplace where office managers can find services to solve any kind of office or facilities need. 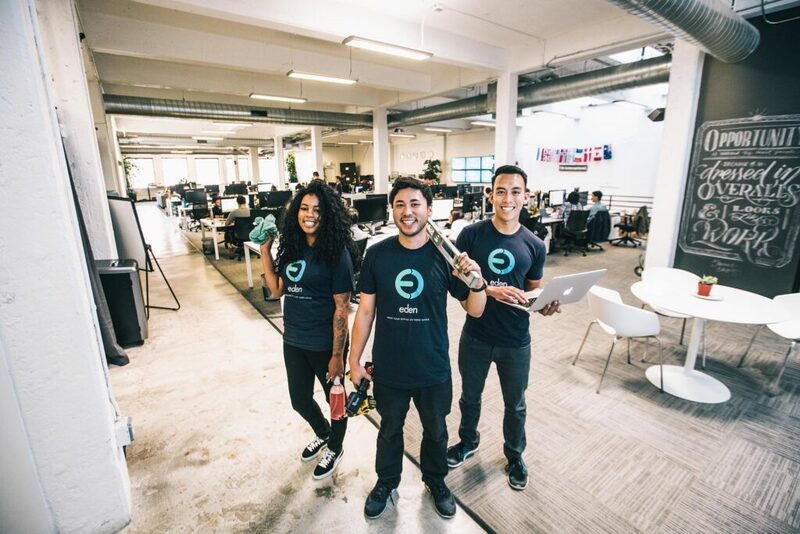 Eden offers services such as office cleaning, handymen, IT support, and catering; they currently serve over 700 clients from Pinterest and Airbnb down to property management companies and small startups in California’s Bay Area. Eden employs a physical workforce who travel to clients’ offices to help with everything from nightly janitorial to soundproofing conference rooms. Physically entering and performing work onsite exposes Eden to a significant amount of risk. Eden needs a solid insurance program to cover bodily injury and damage caused to client’s property—a priority for both Eden and their customers. Before Embroker, Eden relied on a reputable, national brokerage to market their insurance policies. Without comparisons and adequate information, Eden thought they had secured an insurance program that met their requirements. What Eden didn’t know: their assigned broker from the national brokerage lacked familiarity with their industry. Due to a misclassification by the broker of their business model, Eden was OVERPAYING for their coverage. Eden started engaging with Embroker via our ‘Policy Audit’. They uploaded their policies on the Embroker platform to be digitally rendered, and expertly assessed. After doing so, Eden saw data on their peers’ coverage and how much they were overpaying. We commonly see companies with duplicate coverage, missing key policies, and overpaying for their coverages. After viewing these comparisons (completely free for anyone who signs up on our platform), Eden set benchmarks for a reasonable premium and coverage. In tandem, an Embroker expert reviewed Eden’s policies and noticed that their former broker was not familiar with the risks of a technology company with a physical operations team. Not only did the previous broker not understand Eden’s unique risks, they also did not pursue carriers that were writing competitive coverages for this type of business. These missteps resulted in Eden paying a hefty premium for an Errors & Omissions policy with unusual add-ons. After seeing a need for a change, Eden signed a broker of record letter with Embroker. Our team approached an insurance carrier that was writing policies for unique marketplaces and who could offer competitive premium with great coverages. After negotiating on Eden’s behalf, we secured coverage that included General Liability, Errors & Omissions and Cyber Liability and saved Eden $30k in the process. Now that you have a better understanding of insurance for startups, you may be wondering how all of this affects your business and where to go from here. If you need more help or information, you can reach out to our team of expert brokers. Or, if you prefer to get started on intelligent quotes, create your Embroker account today.